The phone rings every week or so and an entry level producer realizes their cattle are multiplying and they need to do something about marketing. Some are casual and some are desperate. I ask questions about what they have done in preparation for this immediate need to market. With few exceptions, the entry level producers have done none of the actions listed below. I am always amazed that people who buy a gas station, a car dealership, or any business understand the importance of a business plan — it always must include marketing. Somehow, in the Texas Longhorn business most don’t have a market plan until some desperate event happens, then many are caught off guard and forced to sell quick for a low price. Starting a Texas Longhorn business is about helping others also learn to start their own business. The following 12 parts of an entry level marketing plan are proven to work with a low budget. Follow along and see how many of these you will find profitable. This is recommended for an entry level, start up, basic minimum marketing effort for a small herd. Businesses start with business cards. Get a pretty card printed with an impressive Texas Longhorn on it, with complete address, email and phone numbers. Never go anywhere without business cards. Give a card to everyone who even casually says the word “Longhorn.” When I started I was more than broke so I bought a rubber stamp and stamped my address on little pieces of paper, business card size. It did the job. Signs are a first for every business. A professional sign along the road to the ranch stating “Texas Longhorn Cattle For Sale” lets it be known to everyone, it is not a hobby, but a business. That opens the door for every neighbor to consider purchases. Do not join the local cattleman’s association, if you expect to find approval. Many try to be a part of the industry then find that 99% only like black cattle and are prejudice to the core for their own selected breed. Anyone not with their breed is an enemy to their association. Don’t waste time and dues money. 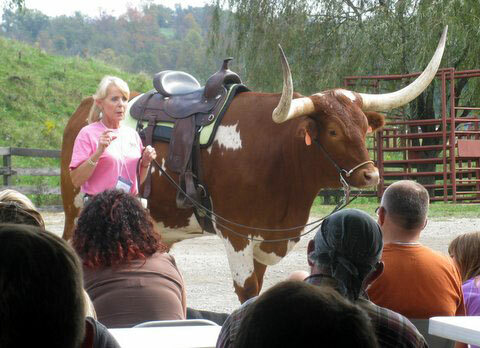 Be ready to show Texas Longhorn cattle to everyone of interest. 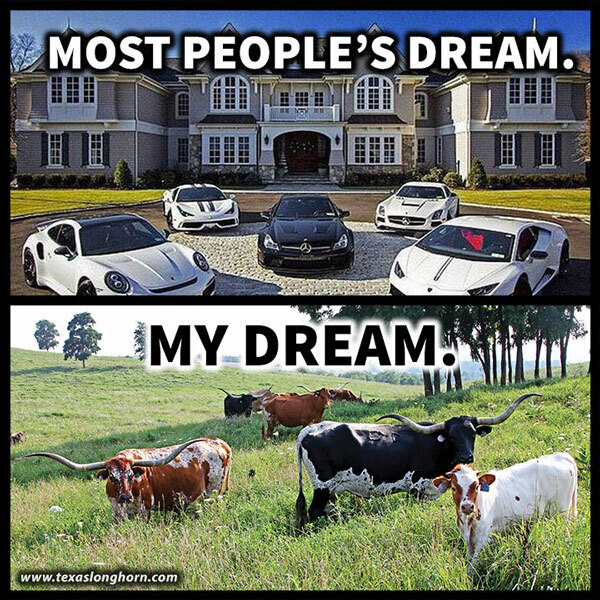 Tell them why you bought them, why you like them, and why everyone should own Texas Longhorns. Personal contact with neighbors and friends is strong marketing. It is the best marketing. Collect email addresses when showing cattle or just talking about Texas Longhorns. Make a list of addresses. Send out e Mail positive information to keep people with a little interest growing into a large interest. Frequent news items about the breed of a positive nature will make good things happen to everyone on the growing list. Local buyers are best. Start out the marketing plan within a 20 mile area. It is always easier to sell, deliver, and service clients who are near your headquarters. The farther away they live, the more costly for transport, and to get people to come view the cattle. When everyone within 20 miles owns Texas Longhorns you can draw a larger circle. Show photos to friends. Always have photos of cattle for sale. Quickly show them to people at PTA meetings, church, during jury duty, weddings, everyone is a prospect. When they see that the cattle make you happy, and they can buy them, good things happen. Show photos of cattle for sale, not the high-dollar cattle that are not for sale. Don’t confuse people. Return phone calls. When calling cattle people who run national ads, most will not return your calls. One secret of sales is the simple courtesy of promptly returning phone calls. While you may not find a return call a priority, your prospect is calling someone else as you mess around. List cattle for sale. When someone arrives at your ranch, have a list of data and prices on everything that is for sale. This is not the time to whittle and fumble around. Commit to a price in writing. Whatever the terms are, have them in writing. Misunderstandings are easy. By handing the prospective buyer a list of cattle for sale they know you are in the business of selling cattle and that you think they are a buyer. Weigh and measure cattle for sale. This is not the time to guess at horns or size. Today’s buyer wants data. They will buy quicker and with more confidence from a seller with good data. It shows you know what you are doing as a producer. You prove you know your cattle with data. Pre-sell cattle. When a neighbor wants a small calf that is still nursing, pre-sell it. Take a deposit and they can get the calf in the Fall at weaning. Without a deposit it is all talk. Estimate what the calf will be worth at weaning and that is the price. It will be a lot bigger and maybe prettier colored in the fall. Pre-sale herd bulls, show cattle after the show, cows after weaning, anything. Take the deposit and do it. Join a local Texas Longhorn affiliate organization. After using the 11 tools explained above you will have sold several cattle and they will probably elect you as president. If there is no local affiliate start one — you already have a client base and a good start on membership. The above 12 actions are what I used in 1967 to sell my first 10 Texas Longhorns, except I did not have e Mail or even a fax machine. It is much easier now. Give yourself a $100 budget and go for it! Just add energy and a pasture with pretty Texas Longhorn cattle.